Fair Day was the kickoff of all things Mardi Gras. I stumbled across the Southern Cross Outdoors Group in the area that had all of the community organizations. The name at least sounded interesting so I grabbed a brochure from the unmanned booth. Looking in a little deeper, one of the events they had going on for Mardi Gras was an authentic Australian bush dance. Australians refer to what Americans call “the country” as “the bush.” I had a suspicion it might be like American country line dancing or some sort of folk dancing. It was Friday night in a foreign country and I didn’t have a whole lot going on. I figured why not? Experiences like these don’t come often I might learn a little bit about authentic, backwoods, bogan Australia. The event was held at the Marrickville Theater about 45 minutes south of me. Getting anywhere is always a bit of an adventure as I’m still learning the trains and completely lost when it comes to buses. When I got off the train it wasn’t at all clear where the bus pickup was so I started walking. 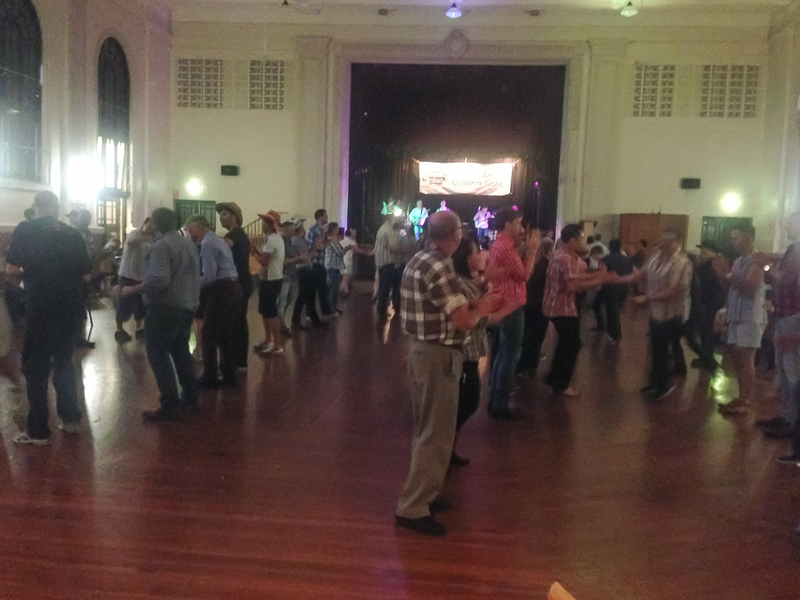 It turns out Australian bush dancing is a lot like American middle school square dancing. I have to admit, I was a little bit timid at first, but armed with a glass of wine one of the more experienced members took me under their wing. There were some undertones to two stepping but the moves were slightly different. Through most of the evening I was mechanically counting out steps to stay on cue. The do-si-do and the promenade all brought me back to middle school. I could remember the days in high school gym during the winter when we all had to learn to square dance. Each of us would be counting out our steps wondering which partner would lock arms with when we had to do one of the integrated moves. While a much more grown-up version, you could see some of the same dynamics at play. All in all, so stoked that I went. This is one of those experiences that’s completely unique to Australia. It was so unique that I didn’t find any coworkers that had been to one before. Ha!